You are here: Home / All Posts / Why Processed Food is bad for You. 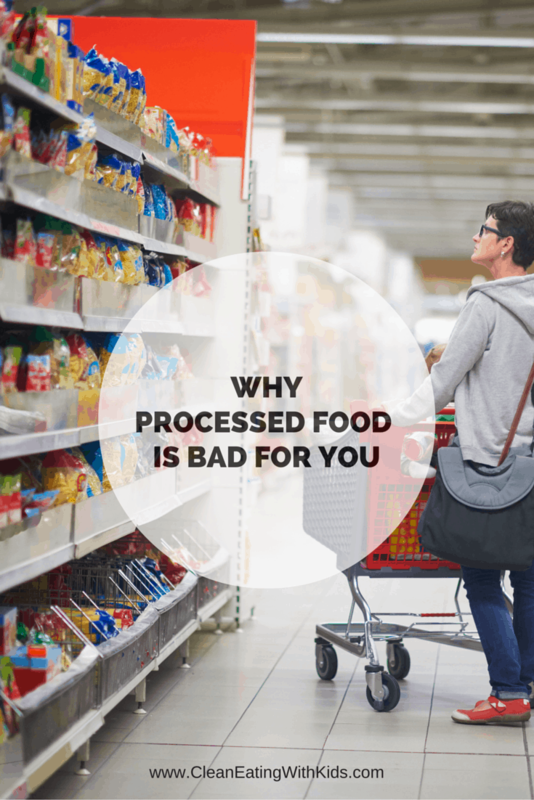 Why Processed Food is bad for You. May 6, 2016 This post may contain affiliate links. 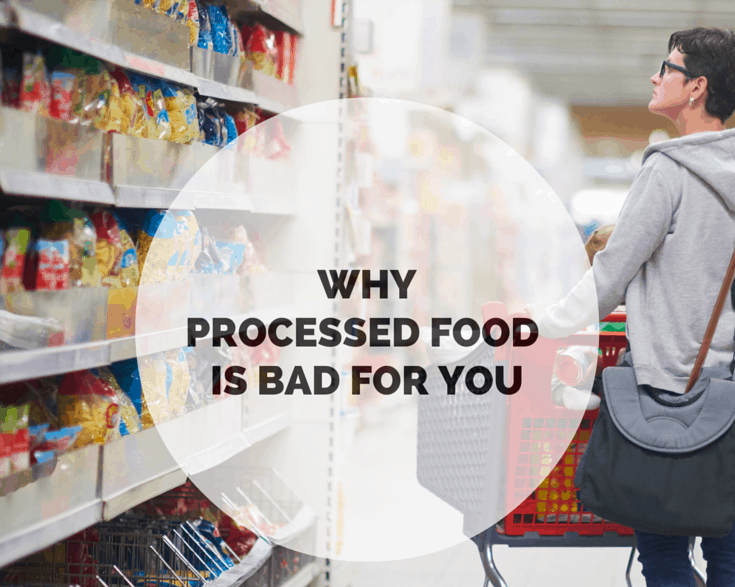 Let’s clarify what the word ‘processed’ means in terms of Clean Eating. Most foods we eat are processed in some way. Fruit is picked from trees, vegetables are sliced and peeled, ground beef ground in a machine, butter has been separated from milk and churned. We call this Mechanical processing. The food is in, or fairly close to, its natural state. It is still a single ingredient and what we call Real Food. But, there is a difference between mechanical processing and chemical processing. Chemical processing happens when artificial ingredients or chemicals are either added to a food, or the structure of the food is altered, so even though it looks like food, our body can’t digest it the way it was naturally designed to. This is what we refer to Processed Foods. This is the food we want to stop eating. To make processed foods taste good, food manufacturers add large doses of sugar. As humans, we are naturally attracted to sweet foods, so that means: The more sugar they add, the more we like it. 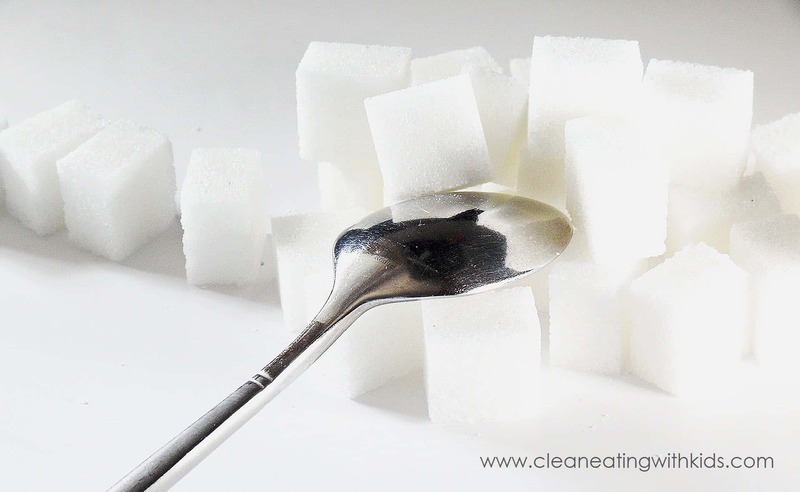 Studies repeatedly prove that a high sugar diet has a dramatic harmful effect on our health. So much so that is has been linked as a leading cause to some of the major health related diseases such as heart disease, obesity, cancer and diabetes. Watch out for everyday household foods that are misrepresented as being ‘healthy’ but are actually high in Sugar such as sweetened yogurts, fruit juices, muesli bars and, my personal favourite, children’s cereals. Take a look at the ingredients on your favorite processed food snack. Chances are, unless you are a biochemist, you won’t have a clue about what some of the ingredients are. That’s because many of the ingredients in there aren’t actually food at all. They are chemicals created in a laboratory designed to make your food taste, smell, feel more attractive to our senses. When I was at school (many, many years ago J), our science teacher recreated an experiment using science room chemicals to make the smell of Apple. Yes. 6 chemicals later, and we could make a pencil smell like a Granny Smith Apple. No matter how ‘Apple like’ it smelled, there’s no way I would have taken a sip of the chemical stew. Whenever I smell ‘Apple flavored’ lollies, I think back to that lesson. Processed food is more science than it is food. Preservatives: These help our food stay longer on shelves without rotting. Flavor:To make it taste and smell better. Remember even though the label may say ‘Apple Flavor’, this flavor may have been constructed using countless number chemicals (not shown on the label). Colors and Textures: These chemicals alter the color and the feel of our food. Not only do processed foods have things added to them, they also have some important things taken away from them. Processed foods are often stripped of nutrients such as fiber, antioxidants, and “good” fats. Whole foods (the good food) contain countless minerals and vitamins that are lacking in processed foods. They are either destroyed or removed during the manufacture process or were never there to start. It’s this reason that a person can be obese and suffer from malnutrition at the same time. The link between eating processed food and obesity is now undeniable. 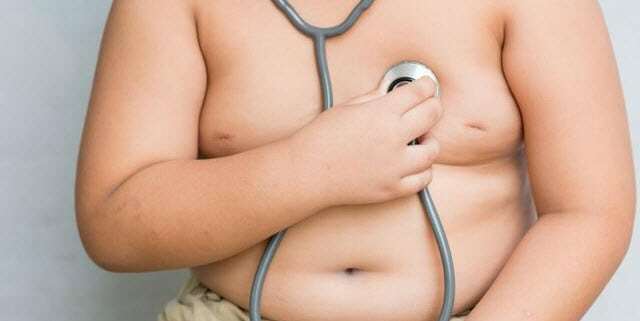 Processed food is making us and our children fat. Overeating is a process that starts in our brain. Your brain is naturally designed to regulate how much food you eat. So, it’s the brain that tells you to stop eating when you have had enough. Think of a breastfeeding baby. No way you can make that baby drink more when they’ve had enough. They will stop when they are done. Food manufacturers have figured out a way to override your brains natural food regulator. They do this by making fake food addictive to your brain. Most processed foods contain high quantities of combined sugar and carbohydrates – which our brain loves! Our brain has evolved to crave sugar and carbs. Up until a couple hundred years ago, they were pretty hard to find in abundance in Nature. Because they were only available in limited quantities, they were a valuable resource. Processed foods have only been around roughly 100 years, and our pre-processed-food brains have not had the time to adjust to the abundance. Your brain still finds it hard to say ‘No More’. Your ancestors would have to work really hard before finding the carbs and sugar that we get from a bag of crisps. Now, we just walk to the kitchen. 5. Processed Foods Are High in Trans Fats or Processed Vegetable Oils. Processed foods are often high in unhealthy, refined seed and vegetable oils containing something called trans fats. Almost all of the bakery muffins, margarine crisps, microwave popcorn and fast-food fries we eat are made using processed vegetable oils. They sound like real food – canola oil, palm oil, nut oil, vegetable oil, but they are toxic to our bodies. I recommend watching the video below if you want to know more about what this does to our bodies. Basically, processed vegetable oil is a nasty, toxic ingredient that makes us sick. Very sick. Our bodies are not designed to breakdown this product effectively and excessive consumption has been linked to eczema and asthma in young children, cancer and even depression. To avoid these harmful seed oils and vegetable oils, eat real fats like butter, coconut oil and olive oil. You guessed it – Just Eat Real Food!